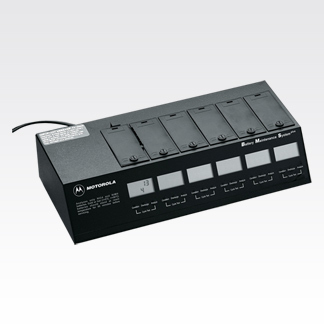 The BMS Plus uses interchangeable battery adapters (sold separately) and is capable of charging and discharging, analyzing, conditioning and cycle-testing batteries. It supports NiCD, NiMH and Li-ion battery* chemistries and tracks battery voltage and capacity (mAh). Its easy-to-use design supports hundreds of two-way, cellular and camcorder batteries. This system is recommended for users NOT using the Motorola IMPRES battery systems. The BMS Plus offers a 3-year warranty and includes serial printer port (RS-232). The WPLN4079BR is a 6-station, 110-volt AC, 50/60Hz system. *WPLN4085AR BMS Li-ion Field Upgrade Kit required to support Li-ion batteries.